If you're a multisport athlete, you know the drill. If you're a multisport athlete, you know the drill. Mornings in the pool with your masters swim group. Running after work. On the bike for a long ride during the weekend. You're always moving — it's part of your DNA. To get the most out of your training, you need smart, versatile tools. And they don't come any smarter, or more versatile than Garmin's Forerunner 935 multisport GPS watch. It's built to record all your training activities, while providing feedback that'll help you up your game. Forerunner also boasts battery life that'll cover the distance, whether you're doing a local 5K or stepping onto the trails for an ultra. I've learned through hard experience that heart rate monitoring is an essential tool for getting the most out of a training cycle. There's really no better way to ensure that you push hard enough during your key workouts, and that you back off enough on the intensity when you need recovery. Forerunner 935's wrist-based monitoring technology makes it easy to monitor your heart rate and hit your target zones, no matter what sport your training plan has listed for that day. Forerunner 935 is the ultimate watch for the triathlete or other well-rounded athlete. It'll record all your multi-sport training, whether you're swimming laps, clipping in for a long ride, or busting out VO2 max repeats at the track. Forerunner 935 also has tools for your other favorite outdoor activities, like paddling, climbing, hiking, golf, and more. You can track the data by selecting from a variety of data fields, or customize the display with Garmin's Face-it™ app, changing the background to any picture stored in your smartphone. Forerunner 935 offers great tools and analytics for runners, recording data on cadence, ground contact time and vertical oscillation, along with all the usual pace and time metrics you're used to. And using the data it records with its heartrate monitor, it will estimate and track your VO2 max, predicting your performance and suggesting training paces. 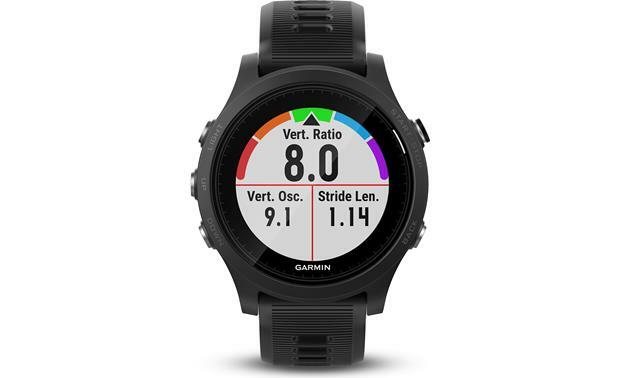 You can pair Forerunner 935 with Garmin's Running Dynamics Footpod (optional) and record a variety of running dynamics that'll help you improve your form and efficiency when you're on the run. When you're in the pool, this watch tracks your distance, pace, stroke count, and more. And quit worrying about keeping track of laps during those long pool sessions — it'll count those for you too. For open water sessions, you'll get an accurate rendering of your distance and pace. Jump on the bike and Forerunner 935 becomes a powerful bike computer. It's compatible with ANT+ power meters, including Garmin's Vector pedals, and syncs up with Garmin's Varia™ lights and rearview radar. You can even receive real-time feedback for your Strava segments during your ride — a great way to keep your motivation high during a tough climb. You don't have to be a roadie to appreciate all that this watch will do. It has built-in profiles to track your effort during indoor sessions and spin classes, as well as mountain bike expeditions. When you're ready to recreate in the great outdoors, Forerunner 935 is a trusty companion, with point to point, breadcrumb, and TracBack GPS navigation when you're on the trail, plus preloaded outdoor rec profiles, including hiking, climbing, skiing, SUP, rowing, and more elevation profiles and ascent/descent tracking you can review after your day(s) in the woods. The built-in altimeter, compass, and thermometer are great tools to have when you're outside, too. Forerunner 935's golf features are a winner on manicured links too, with accurate distance readouts and calculations, plus stat- and score-keeping features. Garmin's smart notifications work with your smartphone to let you receive texts, emails, and alerts on the watch screen. 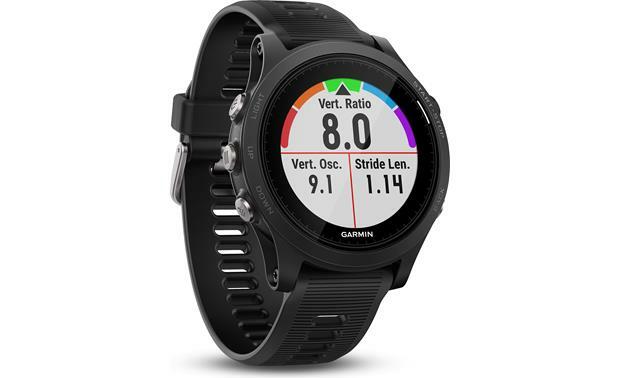 And Forerunner 935 automatically uploads your workout to Garmin Connect, where you can share it with your friends through social media or many popular fitness-tracking apps. Garmin's Live Tracking feature lets your family friends track you in real time — a great safety and race day feature. 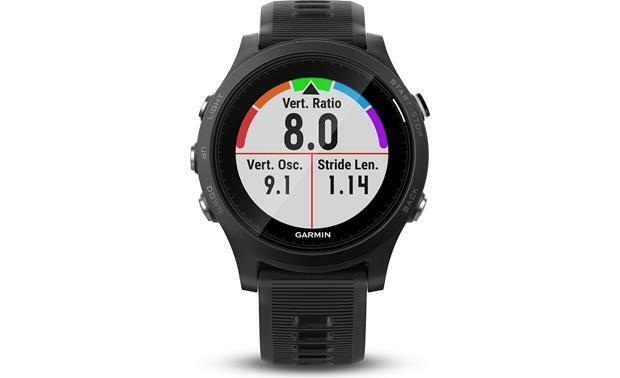 Watch: Width 1.893", Height 2.126", Depth 0.549"
Elevate: On the back of the Forerunner 935 is an optical sensor with Garmin's Elevate heart rate technology that shines light onto your skin and measures the amount of light returned. The sensor detects slight changes on your skin as your heart pumps blood and determines your heart rate using a sophisticated algorithm. The back of the watch has a light seal to block out ambient light for accurate results. You can broadcast your heart rate data to other Garmin devices, such as an Edge cycling computer or a VIRB action camera. Note: The Forerunner 935 is compatible with ANT+ devices, so you could use an optional heart rate monitor strap, if desired. Heart Rate Zones: Heart Rate Zones are used by many athletes to indicate the level of activity, and to measure their cardiovascular strength. You can let the Forerunner 935 set your heart rate zones based on your user profile, or manually enter heart rate values and ranges for each zone. The heart rate zones are expressed as a percentage of your maximum heart rate, and are expressed in color codes on the device's display: Poor 0-40% (Red), Fair 40% (Orange), Good 60% (Green), Excellent 80% (Blue), and Superior 95% (Purple). Running Dynamics: The Forerunner device, when paired with the optional HRM-Tri or new Running Dynamics Pod accessory, can help analyze your running form. The accelerometer in the accessories can measure torso movement and calculate the following running metrics: Cadence (number of steps per minute), Vertical Oscillation (your bounce when running), Ground Contact Time (amount of time you spend on the ground while running), Ground Contact Time Balance (left-right balance of your ground contact time), and Stride Length (measured from one footfall to the next). You can view your running metrics as a color gauge on the display, showing you how your running data compares to those of other runners. Golf Features: Wearing the Forerunner 935 while playing golf gives you access to many features to help enhance your game. Before you play, you can download the course, using Garmin Connect, from the database of over 41,000 courses worldwide. For each hole, the device displays the hole number, par for the hole, and distances to the front, middle, and back of the green. You can move the flag to the precise pin placement for the day in order to show accurate distances. After you play the hole you can enter your score. The built-in odometer can record the time, distance, and steps you travel as you play. The Forerunner 935 is compatible with the optional Garmin TruSwing accessory to let you view your swing metrics and analyze your swing to help you improve your game. Water Resistant: The Forerunner 935 has a 5 ATM water rating, which means it can withstand pressures equivalent to a depth of 50 meters (164 feet). Not only can you run in the rain and wet weather, you can even swim while wearing the device (see note below). The device also has a wide operating temperature range of -4° to 140°F. Swimming Metrics: You can analyze your swimming workout using the Forerunner and the optional chest-worn HRM-Swim. The device offers preloaded swim profiles for open water and pool swimming, and metrics for both (distance, pace, stroke count/rate, calories, etc.). The unit can calculate your SWOLF, or swim efficiency score, which is the sum of the time for one pool length and the number of strokes for that length. Color LCD: The Forerunner 935 features a 1.2" diameter color LCD screen with a resolution of 240 x 240 pixels. The display has a backlight timer that can be set to 8, 15, 30, or 60 seconds, or Stays On. The backlight can be turned on manually, or with the touch of a key or when you receive an alert. High-Sensitivity GPS Receiver: The Forerunner 935 features a high-sensitivity GPS receiver with GLONASS, which locates your position quickly and keeps it locked onto positioning satellites, even near tall buildings or under tree cover. You can turn off GLONASS to save battery power if your GPS signal is strong. Watch Mode: Up to 2 weeks with activity tracking, smartphone notifications, and wrist-based heart rate. Activity Mode: Up to 24 hours in GPS mode and wrist-based heart rate. 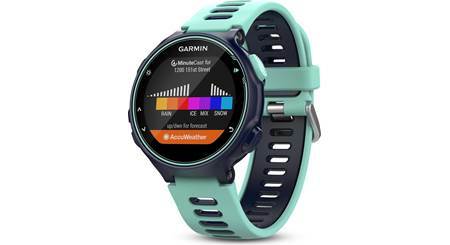 Bluetooth Connected Features: The Garmin Forerunner 935 features Bluetooth Smart wireless technology that allows you to pair the device to your smartphone or mobile device through the Garmin Connect Mobile app. When connected via Bluetooth, you can do the following: Phone notifications, LiveTrack, GroupTrack, software updates, workout and course downloads, Connect IQ, social media interactions, weather updates, music controls, audio prompts, Find My Phone, and Find My Watch. Locating A Lost Phone/Watch: The Forerunner 935 can help you locate your phone if it is still paired and currently within range. As you search, the Find My Phone widget will display the Bluetooth signal strength and sound an audible alert to help you find your phone. Similarly, you can find your lost Forerunner using your phone when they are paired and within range. Wi-Fi Features: In addition to Bluetooth, you can connect the Forerunner 935 to the internet via Wi-Fi. 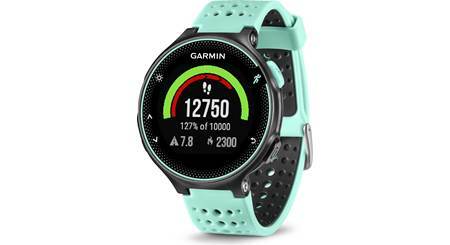 While connected, you can perform software updates, upload activity data to your Garmin Connect account, and search for and select workout and training plans to send to your device. History: The Forerunner 935 has a small amount of memory (64 MB) for saving activity data. Your history displays the date, time of day, distance, run time, calories, average pace or speed, and heart rate zone data. When the memory is full, your oldest data is overwritten. History is not recorded while the timer is stopped or paused. Watch Functions: When you're not working out, the Forerunner 935 can be used as a basic watch, displaying the time and date, along with an alarm, timer, and a stopwatch. The time is automatically set by the GPS receiver (or manually, if desired), and can be displayed in 12-hour or 24-hour format. The FaceIt watch face creator in the Garmin Connect community can be used to customize your device. 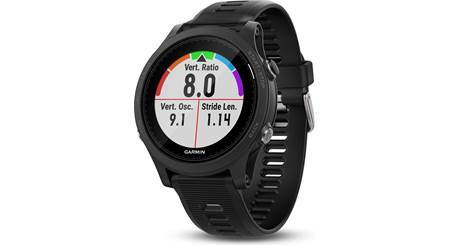 Searches related to the Garmin Forerunner 935 GPS multisport training smartwatch with built-in HR monitor.